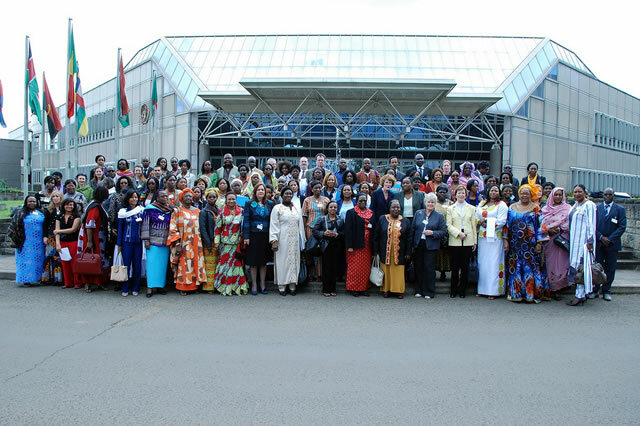 The 17th Gender is My Agenda Campaign (GIMAC) Pre-African Union Summit meeting of women leaders in Addis Ababa took place in Addis Ababa from 21-22 January 2011. Blog by Mary Robinson: I have just returned to Dublin from Addis Ababa where the 17th Gender is My Agenda Campaign (GIMAC) Pre-African Union Summit meeting of women leaders in Addis Ababa took place. I have just returned to Dublin from Addis Ababa where the 17th Gender is My Agenda Campaign (GIMAC) Pre-African Union Summit meeting of women leaders in Addis Ababa took place. Last year I attended the two GIMAC Pre-AU Summit meetings. We were focused on women, peace and security, seeking more commitments and resources from governments to mark the 10th Anniversary of UN Security Resolution 1325. This time I had been invited by Bineta Diop of Femmes Africa Solidarité (FAS) to take part as President of the Mary Robinson Foundation – Climate Justice in a session on Gender and Climate Change / Climate Justice. I was accompanied by Hadeel Ibrahim, board member of the Foundation and Nathalie Delapalme, board member of Mo Ibrahim Foundation. The African Union (AU) Summit this weekend (30-31 January) will reflect on the theme of Shared Values in the African Union. GIMAC focused on three issues which should be part of that discussion, one of which was gender and climate change / climate justice. It was a pleasure to regroup with Bineta and other strong women belonging to the 55 networks which form GIMAC. 15 women had been invited from Cote d’Ivoire, and with other women and men taking part including from the AU and United Nations Economic Commission for Africa (UNECA), the total participation was about 150. The session on Gender and Climate Change – Climate Justice on the morning of January 25th went very well. I spoke at the opening plenary with Thokozile Ruzvidzo, Director African Center for Gender and Social Development, UNECA; Olushola Sodeko, Senior Policy Officer, Department of Resources, Economy and Agriculture, AU; and Dr. Olivia Muchena, Minister of Women’s Affairs, Zimbabwe. Reference was made to the 7th African Development Forum in Addis in October 2010, on the theme Acting on Climate Change for Sustainable Development of Africa. There was broad agreement among the speakers that Africa has been building up its expertise on climate change, and is collaborating increasingly, but that there is almost no gender dimension and too little research on gender relating to climate change. The next discussion looked at the international level such as COP16 in Cancún, and there was a lively presentation on behalf of the African Youth Initiative on Climate Change (AYICC) by Ibrahima Ceesay. He began by reading his poem on climate justice, which required the audience to repeat the refrain after each verse: “climate justice now”! Three working groups then discussed the themes: gender adaptation and mitigation strategies, gender responses to humanitarian crises and youth engagement. Following reports back to the plenary, it was decided that a strong message would be sent to the heads of state at the AU Summit seeking to integrate a gender dimension into climate change, and urging them to adopt a climate justice approach, particularly in the lead up to COP17 in Durban in December 2011, which will be chaired by South Africa. In addition, it was agreed that a small task force – including FAS, the Foundation, and gender experts from UNECA and AU would take forward the recommendations of the working groups and report to the next GIMAC Pre-Summit meeting in July 2011. During the discussion in GIMAC, both in public and in private, I had explained the women leaders’ initiative the Foundation has taken, involving the establishment of the Women Leaders Group on Climate Justice, and the two side events we had co-hosted in Cancun. There was enthusiasm for integrating African women leaders into this group and planning together to ensure a strong gender build up on the road to Durban. As Bineta had promised, we did dance together the first evening, which provided a great opportunity for bonding, sharing jokes and meaningful discussion.